Preface: Prophets to the Nations. December 9, 2018 Posted in Adult Continuing Education, LCBC Volume 1, Prophets and Apostles, Chapters, Learn Christ Commentaries, Prophets and Apostles Class of 2018, Prophets and Apostles, the Bible. The only way the Old Testament Prophets can be out of date is if nations of the world are out of date, for God the ruler of the universe made the Prophets International Prophets, the “Prophet to the Nations”. Since God is eternal, immutability, and determinative in world history, if you want to see and know where nations are ultimately headed then the Prophets are the key, and further if you want to know then end goal of all history, it is: (1) the literal Forever Kingdom to such up all other nations and kingdoms, (2) the Day of the Lord with a “cup of wine of wrath” (Jeremiah 1:5;1:10; and 25:15) for most nations, and (3) After the Second Coming of Christ, God the Father plants New Jerusalem on His favorite spot of Mount Zion in its present location of Israel. NOTE: Lest you think the nations are out of date, the oft repeated islands of the seas takes care of many including the US, however in the language it again shows God preference for Mount Zion in Israel to plant both Himself and New Jerusalem. Since God thinks that spot is so important, as we near the End of the world you notice that focus more and more becomes centered on the Middle East and in particular on Megiddo Israel and the Jezreel valley as the site of World War III, the terminal war to end all wars. Take Damascus as an example, now in Syria and the attention of much of the internal strife in Syria, and you must stop to consider that once it was part of the Northern Kingdom (10 tribes) of Israel as they separated from Judah of the Southern Kingdom, that in the Samaria of the first century Roman Empire, Jesus preached at Jacob’s well to the Samaritan woman about the water of life, and later in Damascus of Samaria Paul on the way to persecute Christians there saw a vision of the Ascended Christ and was converted, later believers were first called Christians in Antioch of Samaria. It is easy to tire of all these predictors of the END, such as the one correlating Turkey with Damascus and Israel as Turkey (we have no evidence now that Turkey will be the prime attacker, but the indications are for Syria, Iran, and Russia); however this sensationalist bases his predictions of the Old Testament Prophets on the complete destruction of Damascus, perhaps the oldest continuance city in the world. Take for example the Prophet Isaiah’s proclamation against Syria and Israel, in particular against Damascus once a powerful and prosperous city in the world from Isaiah 17. Granted that Damascus has been destroyed and rebuilt many times, one notable being when Assyria took the Northern Kingdom captive and deported most of the residents filling the city and Northern Kingdom with other foreign immigrants, but as you read these words and the rest of Isaiah 17 you get as Carroll states a sense of partial fulfillments of a prediction to be completely fulfilled at or near the END. If you have opportunity read please Isaiah 17 and you will note that it stresses often “in that day” with a reminder of the Day of the LORD and Lord of the whole Bible; and you can not help but think with the total message of 17, especially with the bottom line of 17:12-14, that this is the same cup of wine of the wrath of God as with the other Prophets. Like a rolling thing before the whirlwind. 14 Then behold, at eventide, trouble! And before the morning, he is no more. We must distinguish between these four major Writing Prophets. If God called Jeremiah to be a Prophet to the nations, and He did, how is it that Daniel, Ezekiel, and Isaiah also had much to say about the destiny of the nations, yet were not called Prophets to the nations; or were they? First, the call of Jeremiah, the priest, to be a Prophet. Our problem is that nowhere are we told that Jeremiah actually visited other nations, except Egypt near the end of his ministry. Somehow we know that Jeremiah delivered these messages to the 21 nations that are named after 25:27, since he tells us in 25:27 that he did take the cup at Jehovah’s hand and caused all those 21 nations to drink of it. He must have either visited these nations or wrote down the messages and sent them to the nations to read. Is there the possibility that he did some of the work through Ezekiel and Daniel. Ezekiel and Daniel were already captives to the North. Ezekiel was taken captive to Babylon in 598 B.C. where he like Jeremiah preached the destruction of Judah and Jerusalem. Daniel was taken captive earlier, in 605 B.C., the first year of Nebuchadnezzar invasion of Syria and Palestine. While Jeremiah and Ezekiel were both priests, Daniel was a statesman and governor. Ezekiel was called to be a Prophet five years after with King Jehoiachin he was taken captive to Babylon. It is clear from the call of Ezekiel to be a Prophet recorded in Ezekiel 1,2 that Ezekiel was called to be a Prophet only to Israel in Exile. The call begins with in the first chapter a vision from God. What a ministry as a Prophet, to Israel a nation of rebels who may not listen to him, and that the bottom line of his ministry is that the people must know that there is a prophet of God among them. The beginning of Daniel is more historical that a call to be a Prophet like Jeremiah and Ezekiel. I think herein we have found a way that some of Jeremiah’s messages to the nations could get at least to the Chaldeans. As we know from the history of Daniel in Chaldea, Daniel became a leader in the palace of the kings. P-2: Messages to Five Nations. Also Jeremiah 27 tells us of how the messages got to five kings of the 21. It is interesting that the word came to Jeremiah as to what to do at the beginning of the reign of Jehoiakim, but it was to actually happened during the reign of Zedekiah. Following the commission of Jeremiah of how to get messages to five of the nations, God gives the message. (1). The Great Maker of History explains Who He Is. LORD of hosts, the God of Israel. Creator of earth, man, and animals. NOTE: Hopefully in this context and the verse of Jeremiah 27:5, our concept and knowledge of progressive revelation in the Bible leads us to see how early in ancient history God let Himself be known, not only as the God of Israel, but also as the LORD of Hosts, alias the God of all nations and the Universe. And if you fail to see the control of God in human history and among nations operating here undeniable, then I feel sorry for you. Either you have a severe problem with intellectual honesty, or you have failed to comprehend this Scripture and many others which teach God as always and ever at work in human history. The end of this reign is determined as “until the time of his land comes”. God will punish the nation that will not serve the king of Babylon with sword, famine, and pestilence. A warning not to listen to your nation’s prophets, your diviners, dreamers, soothsayers, and sorceress who tell you not to serve the king of Babylon. The nations that serve the king of Babylon, God will let them remain in their own land to till it and live in it. These same words were spoken to King Zedekiah of Judah, also to the priests and the people., “Until the Time of His Land Comes”, no doubt a phrase that we have never heard and perhaps never read in the Bible; however, which not only implies but states: (1) God sets the lands of the nations, past and present; (2) God determines the time in history that a nations will rise and fall. The implications of this phrase and this scriptural context are awesome: it implies, yes demands, that the same God who determined in detail all the nations and their boundaries will do the same today for the United States and their neighbors. It would far harder to prove that God dealt that with nations in the Sixth Century B.C., then stopped. In fact, we cannot possible believe that as we know that another Prophet about to considered in this chapter, Daniel, prophesied concerned the Greek and Roman nations as well as the everlasting kingdom of Christ. Edom? At first, it may confuse us to find that the promise is also to Edom as well as the other close neighbors of Judah, for we know that hundreds of years ago, the Prophet Obadiah, 840 B.C. recorded for God the prediction of the destruction of Edom, to the extent that the nation would disappear. Now, here in Jeremiah during the reign of the last king of Judah, Zedekiah (597-587 B.C. ), it is finally in the patience and work of God to be executed. Jeremiah 49:7-22 is almost identical to Obadiah, and the message of complete destruction the same. P-3: Isaiah on Edom, Other Nations, and Earth’s End. Like Carroll indicates, you go to Isaiah for the whole spread of Prophesy, both predictive and the message for the time. The introductory words of Isaiah place it at a time before Jeremiah. For one thing the well-established historical event of 710 B.C. from secular and Biblical history, the destruction of Sennacherib’s army, is at the center of Isaiah. Also it is known from both histories that this same year marked the beginning of a great political movement in the Gentile World, the foundation of the Median monarchy that finally broke the yoke of Babylon. Sampey writes of the period of Isaiah. Isaiah is the great landmark writing Prophet of the Bible, considered the prophet of Prophets. Before him were Obadiah, Joel, Jonah, and Amos; contemporary with Isaiah were Hosea in Israel and Micah in Judah. B.H. Carroll in his volumes of AN INTERPRETATION OF THE ENGLISH BIBLE divides the Writing Prophets into three Periods: first, the Prophets of the Assyrian Period–Obadiah, Joel, Jonah, Amos, Hosea, Isaiah, Micah, and Nahum; secondly, the Prophets of the Chaldean Period–Zephaniah, Habakkuk, Jeremiah, Ezekiel, and Daniel; and thirdly the Persian Period–Haggai, Zechariah, and Malachi. Isaiah 13-23 is called “The Book of Foreign Prophecies” as it deals with these other nations around Judah and Israel. Messages are recorded for ten foreign nations and in this order: Babylon, Assyria, Philistia, Moab, Damascus, Ethiopia, Egypt, Dumah, Arabia, and Tyre. Dumah is Edom in this list: that is found in Isaiah 34. Yet the passage of Isaiah 34 implies much more scatological judgement than on Edom, as if Edom has become a symbol of all on whom God will rain out His final wrath. You see both the eschatological and the general nature of world judgment at the beginning of chapter 34. In the last verse you see God’s judgment on the heavens as well as the earth, definitely an eschatological event of the end of the last days. But one thing that will help us in our study is that we can see judgment against the particular nation named Edom has already been pronounced. Isaiah deals with many nations in his book. A summary follows. While God is letting Isaiah know and tell all about the destruction of nations, and some with eschatological content, He lays the ultimate devastation on the earth. This is one of the few times that it is so clearly spelled out and with so many details. We need to know the message; and we need to know the words so that we recognize those word when they are being quoted in the words of other books of the Bible. This will enable us to distinguish between predictions that have more short time and then final time fulfillment. This is a judgment on the earth and its inhabitants. It will be a democratic judgment on all peoples. The earth completely laid waste and totally plundered. (1). You must see that this word is spoke by the LORD Himself. (2). The earth dries up like a drought and withers, and at the same time the exalted people of the earth languages (it takes time). (2). Earth’s inhabitants are burned up with very few left; wine and merriment are gone; gone also is the sound of music instruments and revelers, and of the joyful harp. (3). Gone is wine and song, the taste of the beer, cities lie desolate, houses boarded up, cries come for wine, joy turns to gloom, and there is no gaiety on the earth. A look back at our outline of chapter 5 of the book of Jeremiah, we will see that Jeremiah 46 is a prophecy about Egypt, Jeremiah 47 about the Philistines, chapter 48 about Moab, chapter 49 about Ammon, Edom, and others; and then in chapters 50 and 51 the fall of Babylon is predicted. First, we should note a very significant change in Daniel 5:30 as Belshazzar, king of the Babylonians is killed, and Darius, the Mede took over the kingdom at the age of 62. P-4: Another Look at The Gospel Explained. Where then do the Apostles come in? 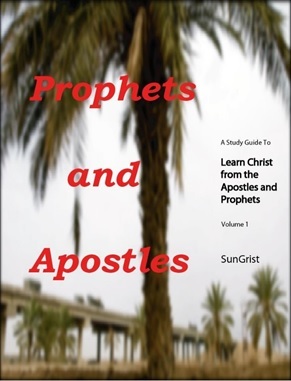 They complete the Gospel story that God the Holy Spirit started in the Prophets, and of course the Lord Jesus Christ fulfills as the Prophet Messiah predicted by the Prophet Moses, the Gospel and all things. NOTE: Do not forget that the Magic Outline, or the Outline of the Old Testament according to the New Testament, and New Testament quotes is in this Top 12 Topics of the Bible outline, placed under the headings of (1) the Old Testament quote itself under “The Gospel Proclaimed”, (2) “Presented” From Matthew, the location in this most thorough gospel as related to quotes, often by Jesus, (3) “Explained” with quotes in Hebrews and Romans, (4) “Reinforced” with the Old Testament quotes in Luke, and (5) Append sized with the Old Testament quotes in Mark. Or from the top headings of the Appendix of this volume 1, below. You are welcome to free download the textbook if you want to check on the best Word of God study possible, or if you want the free download at www.biblecombibleman.com/LearnChristVolume1.pdf . to Jerry McMichael at sungrist@gmail.com. Thank you for your time.